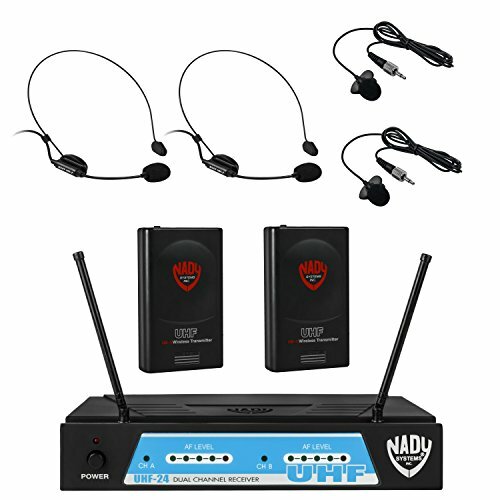 The Nady UHF-24 Lapel / Lavalier + Headset Microphone Dual Wireless System with True Diversity - 4 Microphone Bundle is a professional UHF wireless system packed with all the features you would expect from one of the most trusted and respected wireless brands on the market today. The Nady UHF-24 Wireless System consists of a half-rack receiver with folding front-panel dual antennas that gives you clear channel UHF operation for optimum interference-free performance. This system includes a UHF-24 receiver, (2) UB-4 bodypack transmitters, (2) HM-3 headset microphones, and (2) LM-14/O lapel microphones. Operating Range: Up to 250ft. typical; up to 500ft. Dimensions: 4.25 x 2.5 x 1.0"
This is a single fixed-frequency wireless system. Please consult the manufacturer to confirm compatibility when attempting to use two or more of this system simultaneously or use it with other wireless systems.